Hello November! It’s officially the holiday season! In just a few short weeks it will be Thanksgiving, and the holidays will be here before you know it! So since we have several major holidays coming up, we’re going to split this post up into 2 posts, one for Thanksgiving and another for Christmas! 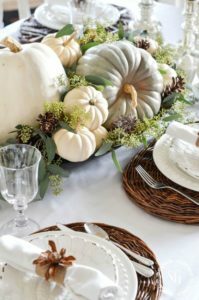 These posts are all about table decor and centerpieces to help make your gatherings more festive this holiday season! So pour yourself a cup of coffee or hot cocoa and enjoy these holiday ideas to help get your creative juices flowing! It’s Thanksgiving time so of course pumpkins and gourds are going to be the main theme! 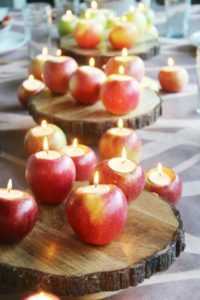 And honestly, they can make beautiful centerpieces by themselves! 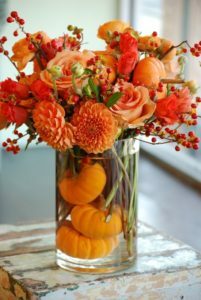 Using a pumpkin as a vase for a floral arrangement makes for a very festive centerpiece! Add some fall flowers and twigs and voila! They also look great in vases too! If you do this make sure you get a clear vase that is big enough to fit your mini pumpkins! This centerpiece is a fun one and is created with thought and love. 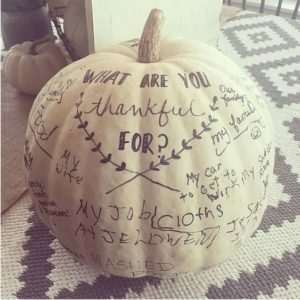 Have everyone sign the pumpkin and jot down what they’re most thankful for. This is a centerpiece to treasure! 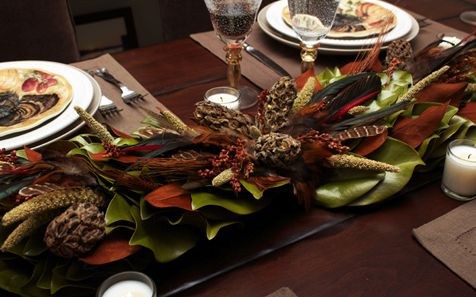 Traditional cornucopias are always an elegant piece to add to the table. 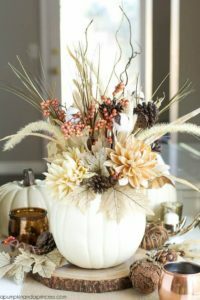 Filled with either a rich and colorful fall flower arrangement, or gourds or BOTH! 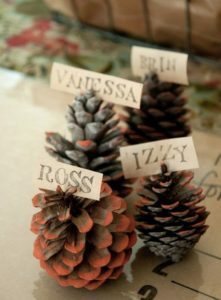 Pine cones are such a cute way to assign name tags and seating arrangements! 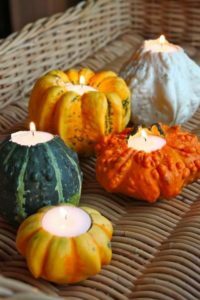 Candles always make for a great aesthetic, gourds can make cute and festive votive for tea lights! And even apples! Apples are also part of the fall harvest! And for the minimalist. 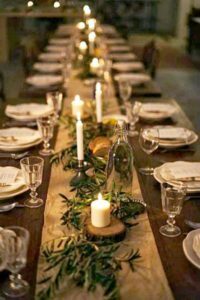 Minimal lighting with a simple runner, candles, and twigs can make for an elegant and romantic setting. 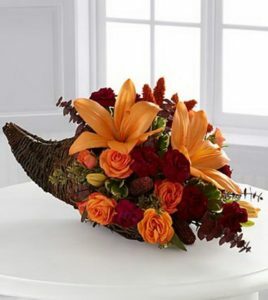 And a personal favorite, our Autumn Bouquet! 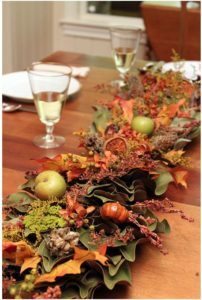 😉 Step into fall with a rich array of bright autumn leaves and accents against our dried magnolia leaves that have been cut fresh from the farm and then dried. Full with Autumn’s bounty, it features mini pumpkins, apples, broomcorn and fall leaves, as well as magnolia pods gathered from the farm. Well, that’s all for Part 1! Which is your favorite? Stay tuned for Part 2, our Christmas edition!